The colors are popping on the trees along the Northeast's mountains, the sun is warm and the air crisp, and it is a great time to go hiking. This past weekend the reds and oranges and yellows began to appear prominently in the landscape of Berkshire County, and I'm suspecting next weekend may be our peak foliage. No matter what your physical capabilities, you should get outside for a walk or hike. There are trails for all ranges of hikers, from novice to advanced, from long treks up Massachusetts’ highest mountain (Mt. Greylock) to short loops in local state parks. 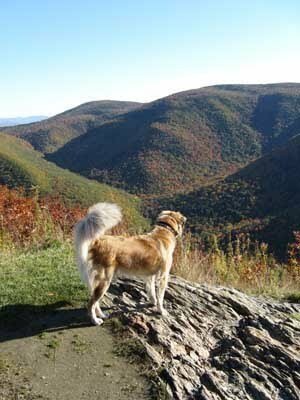 On Saturday my dog and I hiked Haley Farm Trail to the Stony Ledge overlook on Mount Greylock and back down again. It’s a little over 2 miles in each direction, and it can be fairly steep in some areas. But the view when you reach the top is amazing. There are some picnic tables, a lean-to, and a bench where hikers can enjoy the views, relax, or spend the night. I forgot to bring my camera on my Saturday hike up Haley Farm Trail to Stony Ledge. This photo of my dog Lily is from the first week of October in 2008, same place. And, oddly enough, the leaves on the trees were not as colorful as they were on this year's hike (Sept. 25, 2010) — it seems we have an early foliage this year. A few evenings a week, when I return from work, my dog and I head to one of our nearby state parks and take 30- to 45-minute mini hikes/walks. There is just something about the autumn air and these last few weeks of sunshine after work that is just so enjoyable and invigorating. I recommend to everyone that you head outdoors and enjoy a short walk or a heart-pumping hike in the woods in your area — I doubt you'll regret it. • Bring plenty of water. The air may have cooled off, but your body still expends moisture when exercising — you need to hydrate. • Wear proper shoes. This will help prevent blisters, rolling your ankle, and slipping. • Watch your footing. Acorns are everywhere this time of year — I swear I felt like I was walking on marbles in a few areas (a hard hat could be helpful too; they're still falling off the trees). Also, leaves, especially when damp or wet, can be extremely slippery. Hiking poles or a simple walking stick could prevent a serious fall. • Know where you are. Bring a trail map, a compass, a GPS, or a cell phone. Getting lost could be a simple frustration or could turn into a frightening night in the woods. Also, tell someone where you are going. Storey's book, The Hiking Companion, can provide you with more information on hiking preparations and precautions. I'm sure there are more advisory points I could make, but those are the key ones that came to mind. My main advice, however, is to just get outside, get some exercise, and enjoy the fabulous colors of the fall foliage!